Q: What exactly does Bird-X do? A: Bird-X, Inc. has spent over 50 years protecting public areas from over 60 bird-spread transmissible diseases. 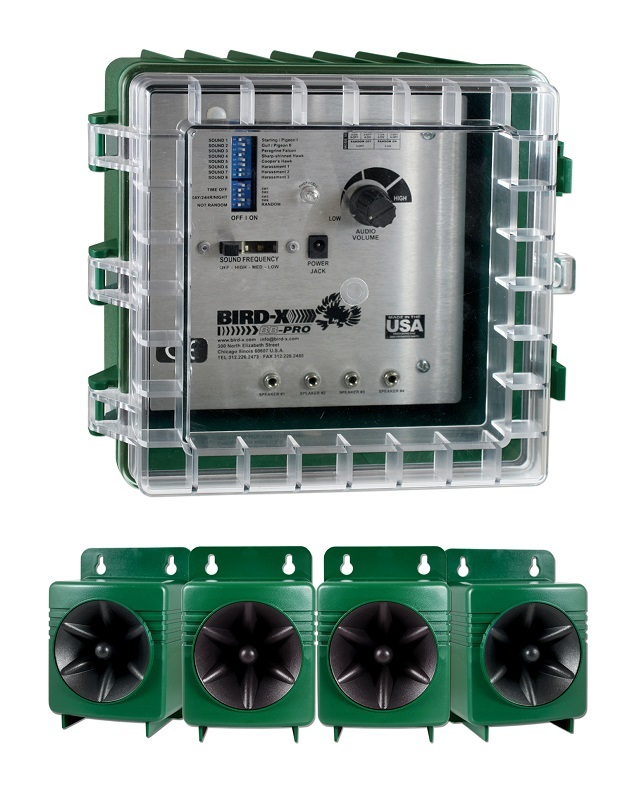 The leading international brand of humane bird control solutions, Bird-X manufactures a complete line of unique bird control products, protecting the health of humans, wildlife, and the environment by deterring birds from unwanted areas without harming them. Q: What is the difference between sonic and ultrasonic devices? A: Sonic devices incorporate naturally recorded bird distress calls and predator bird cries. These are extremely effective, as they tap into birds’ instincts and survival techniques. If they hear a bird of prey, they will vacate the area. The ultrasonic devices emit a silent-to-most-humans frequency that is detected by birds and other small pest animals, and is a very directional frequency. These devices are effective wherever pointed – think of an ultrasonic frequency being emitted similarly to a laser pointer, very directional and cannot penetrate solid surfaces. Q: What products are best for keeping birds away from your house? Are your products species-specific? A: We recommend a synergistic approach to bird control. By using more than one product, homeowners can attack multiple senses and create an extremely uninviting environment for birds. Many of our sonic devices are species-specific, with targeted bird calls for everything from woodpeckers and crows to pigeons and seagulls. Q: You’re very passionate about providing sustainable solutions; could you tell us something more? A: With so many products on the market containing harmful chemicals or flashy gimmicks, it has been important to Bird-X to provide residential and commercial customers with nontoxic, long-lasting, effective bird and pest control, whether inside or outdoors. Bird-X believes in hassle-free setup, and most of our products can be installed without the need to hire expensive pest control operators. By investing in effective bird control, consumers save on cost of maintenance and cleanup, as well as prevent unnecessary liabilities from unsanitary and slippery surfaces. Q: Why should someone choose Bird-X? A: Choose Bird-X for honest, customer-centered service. Our dedicated team of experts are on-call all day during business hours, and are happy to assist customers in finding the right product or products for the job. We have been in business for over 50 years, and know the industry inside and out. Our Satisfaction Guarantee with electronic devices ensures customers’ peace of mind when selecting the bird control device that is right for them.